We need a quilt for the daybed in our home office/guest room and I can’t settle on a design. I want the center of the quilt (the top of the daybed) to be solid gray. I want to stay away from symbols (pluses or crosses, for example) but I don’t want the quilt to be completely boring. I need to find a design that can fit in the 12 inches or so that will overhang the bed without the design feeling like one big border. I have been scouring Pinterest for minimal designs and racking my brain. I think I’ve landed on something that will work and then I lose my confidence. I think minimal designs are the most challenging. Does anyone have an interesting approach or design secrets they would like to share? 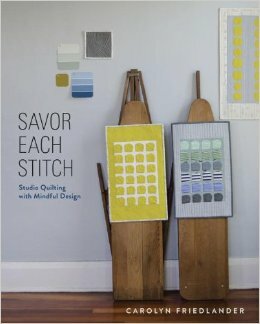 I wish Carolyn Friedlander’s new book Savor Each Stitch was available! I bet she has some nuggets of wisdom that would help. This entry was posted in quilts on February 4, 2014 by brigitdermott.